The old Army axiom to train as you fight and fight as you train is every bit as true for first responders. What this really means is that training has to be as realistic as possible to prepare for the real-life emergency. For firefighters, the problem is that you can’t routinely set fire to old buildings for the training value. However, if you look around your city, town, or county you may find the next best thing, a realistic environment in which to train without setting fire to anything. 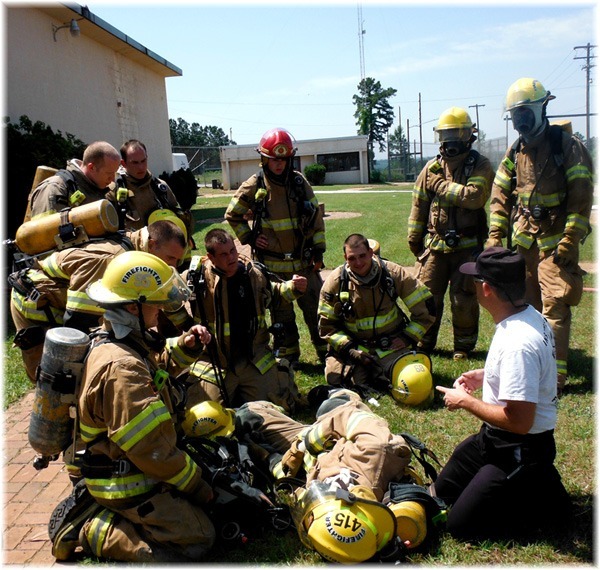 This is what the Eufaula Extension of the Alabama Fire College did to overcome a training challenge. They already had a great fire-school drill field and classroom, which they built entirely on their own, but the lead instructors wanted access to bigger buildings for maze, search and rescue, and firefighter survival training. They found it. Just South of Eufaula sits a 250-acre urban facility that until recently had been abandoned. An adjacent landowner bought the property about 6 years ago and has turned it into the Southeastern Equipment and Technology Advancement Center (SETAC). He agreed to let the Eufaula Extension use it for training, without condition. Within SETAC, an old "administration building" caught the eye of Lead Instructor Lt. Deslie Galloway. "It is about 7800 square feet. It has long and short hallways, multiple large and small rooms, odd-shaped rooms, and most of the building is very, very dark. This makes it really useful for us to conduct maze, search and rescue, and firefighter survival training. To my knowledge, it’s the largest maze building in the state," he said. Chances are that somewhere in your county, city, or town there are buildings and facilities that will work to enhance your training. Access to the ground floor of an office building or warehouse on a training weekend when no business is being conducted may be a real possibility. A building that is empty or abandoned may also be an option. Even if the owner agrees, though, you probably will need approval from your local government, too. In addition, be sure to reach an agreement with the property owner that addresses the issue of liability. Once you have secured a suitable training site, creative approaches can turn seeming limitations into realistic training scenarios. At the Ready recently spent the day with Galloway, fellow instructor Fire Medic Warren "CJ" Jones, and 11 Fire College recruits as they trained in the SETAC building. Limitations on personnel make Search and Rescue (SAR) and Firefighter Survival Training especially challenging for rural departments. 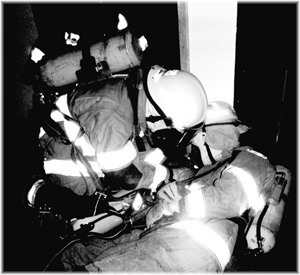 During one training iteration, with two two-man teams already training inside the building, the instructors took the opportunity to turn a recruit that had become separated into a downed firefighter. This caused the automatic activation of the third two-man team to intervene, find and recover the downed firefighter. 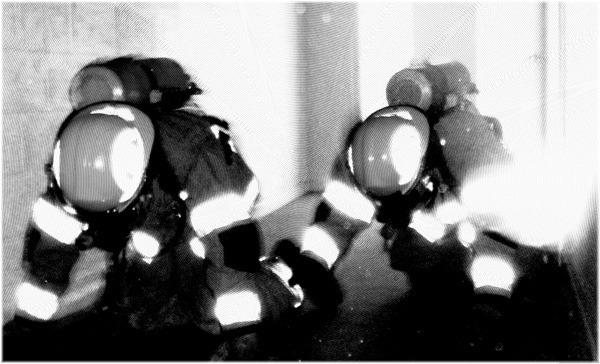 In larger departments, the third team to enter the building is generally a 4-7 man Rapid Intervention Team (RIT). However, with a 13-man shift, the Eufaula force can’t afford to dedicate that many firefighters to a RIT team. To overcome this challenge, the Eufaula department uses a two-man Rapid Intervention Crew (RIC). This RIC methodically worked its way toward the downed firefighter. You may be wondering where the Firefighter Assist and Search Team (FAST) team is in all this. In this case, Eufaula’s RIC is also their FAST. There is a three iteration approach to training this most critical skill. The first two- man team crawled, dragging hose, and conducting primary search to find the seat of the fire. Their mission was to "put wet stuff on red stuff," as Galloway put it. Minutes later, the second two-man team entered the A-side and began search and rescue. After crawling the hose-line for about 20 feet, though, they came upon a long hallway on the left side running perpendicular to their position. This is where the instructors threw them a curve by breaking one of the two recruits down that hallway, initiating a break in contact. A minute or two later, Fire Medic Jones asked the recruit still at the hose line if he had accountability of all his people. When the recruit responded affirmatively, Jones initiated the teaching point, "No you don’t, he is way down that other hallway. What are you going to do, recruit?" Galloway calls this "flipping the classroom" because it forces and teaches recruits to think through situations. "It creates madness, but with a method," he says. "When these recruits are facing real fires, they will be facing madness. By presenting these situations in realistic settings and forcing them to think through them, they will be better prepared…We like to create as much confusion as possible in these training evolutions." In the Fire Academy, this training is accomplished first in the classroom, then in the building. Dedicating this type of training drill for your department is possible over a weekend, whether introducing new recruits or refreshing your veteran personnel. Realistic training and smaller shifts are always a challenge, but small departments can overcome them with a little bit of creativity and negotiation.